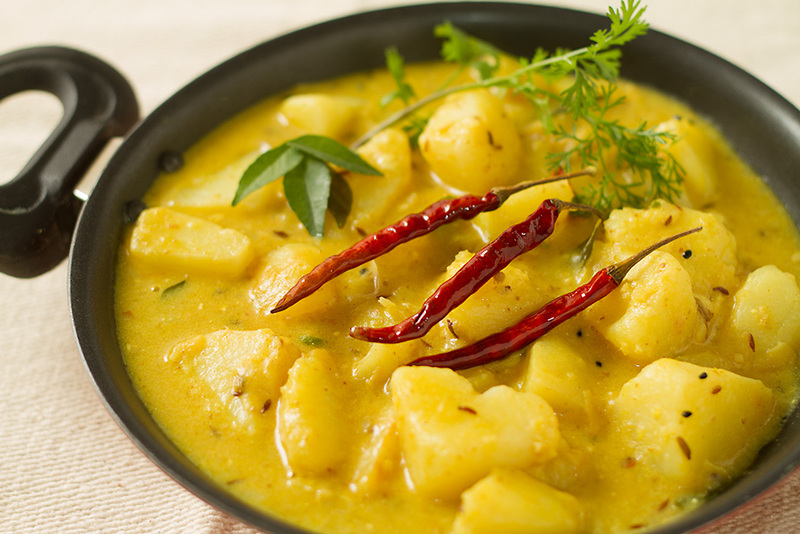 Potatoes are not an Indian vegetable but today, it’s impossible to imaging Indian cuisine without the goodness of this starchy carbohydrate tuberous vegetable. Dahi ke aloo is a potato gravy with fresh herbs and mild spices has the goodness of potatoes and is one of the easiest to prepare. While adding besan (gram flour) is optional, adding it in the curd gives it a nice flavour and makes the gravy thick. Remember to put very little though, else the gravy will be very thick and loose it’s texture. The potato is a starchy, tuberous crop. The word “potato” may refer either to the plant itself or to the edible tuber. In the Andes, where the species is indigenous, there are some other closely related cultivated potato species. Potatoes were introduced outside the Andes region approximately four centuries ago and have since become an integral part of much of the world’s food supply. It is the world’s fourth-largest food crop, following maize, wheat, and rice. Wild potato species can be found throughout the Americas from the United States to southern Chile. In a pan heat oil and add cumin, turmeric, asafoetida, fennel seeds, onion seeds and after a few seconds add chopped green chilies, curry leaves, ginger and garlic. Fry for a second or two and add whipped curd mixture. Keep stirring. Add the boiled and crushed potatoes, add salt and let the mixture boil for about 5-7 minutes. Serve this delectable dish with hot pooris and steamed rice . Simple and good recipes. Please share vegetarian ones.